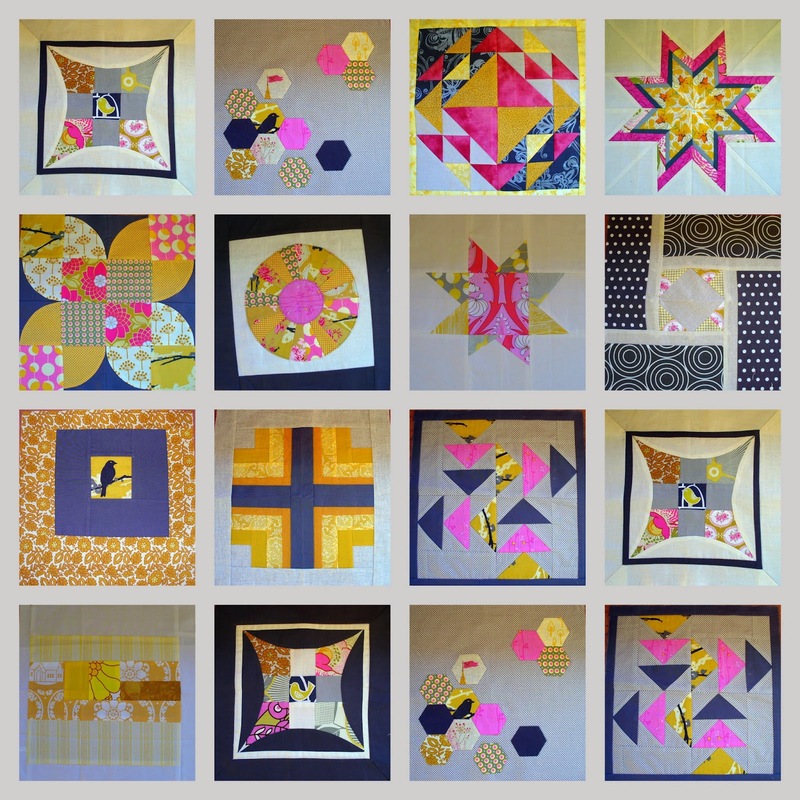 You might remember me mentioning earlier in the year the Modern Quilt Bee I signed up for. Last month was the end of round two. I just thought you might like to see how things turned out. Here are the blocks I've produced which are now winging their way to new owners as I type this. Thanks again Cat and Leonie for organising this Bee. I know how much hard work it can be. I've really enjoyed getting to know a few new bloggers along the way, and its always a delight to discover new blogs. I knew which block I really wanted to try for my round two one. It involved curved piecing. I like the inter-play of curves and straight lines in patchwork. I took a lot of inspiration from other quilter's on line - flickr mostly. Funnily enough the one I found most challenging (Kelli's bright rainbow) I felt turned out the best with the block design I had selected - but there was quite a bit of 'audition' of fabrics to get to the final version. And as for my quilt - well I'm still waiting for a couple of blocks to come in, but I have been looking around at ideas for how to put it all together. I love the sashing on this one. These are the blocks I have so far - some were from the first round (we are now in round two), some are my experiments and a couple are from round two. Its really is starting to look like a lap quilt which is exciting and I'm super glad I decided to add pink (its not my favourite colour at all) but the mustard/grey combo really needed something to give it some punch. I think what I'm enjoying the most about the process is playing with the combinations and delighting in the different effects on the eye you can achieve just by rearranging them. Lala loves this game too, I might add. 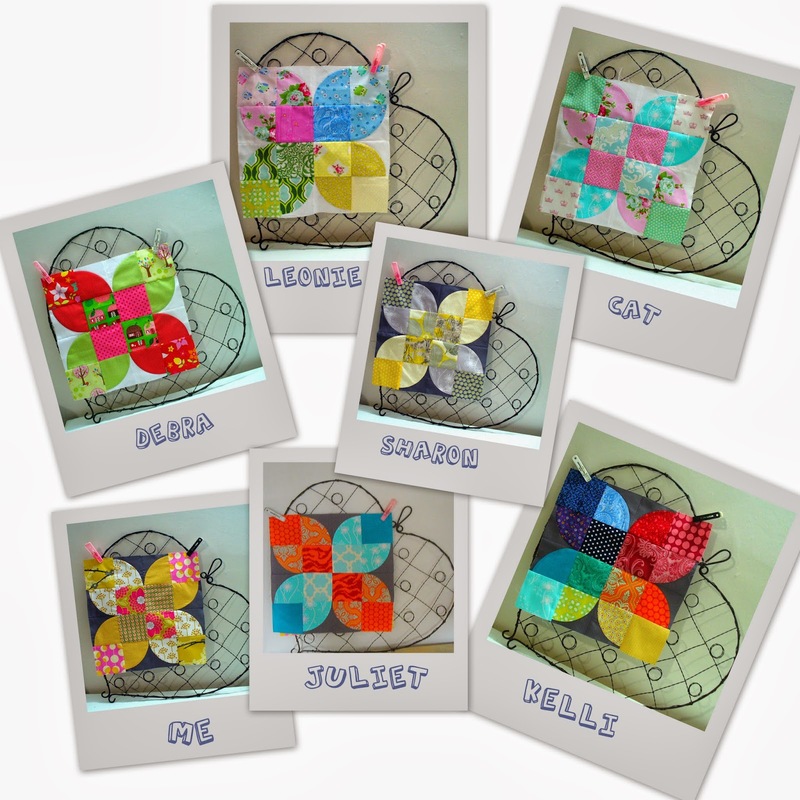 Its so much fun arranging quilt blocks isn't it? Rascal and I love doing it too. Your quilt is coming together beautifully, and yes that touch of pink makes all the difference. Wow, all your curved bee blocks look amazing! They look like little butterflies.